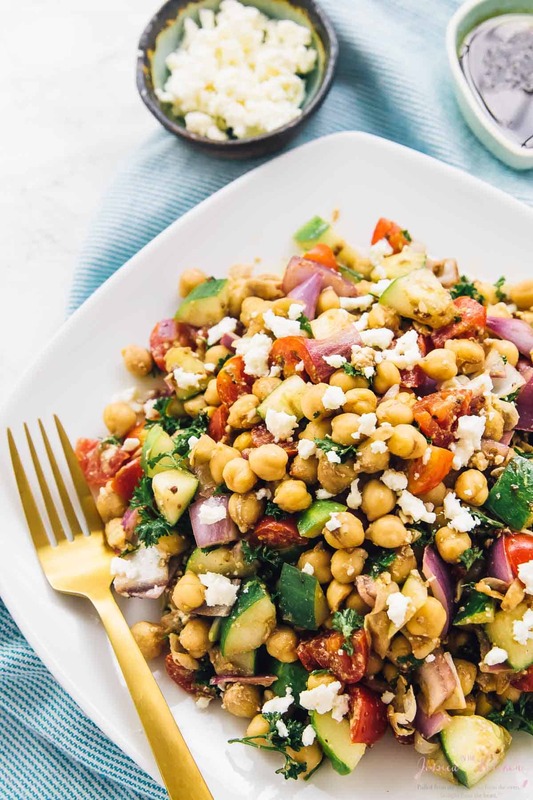 This 15-Minute Mediterranean Chickpea Salad is loaded with delicious and filling veggies, made in just 15 minutes and is perfect for meal prep! Oh chickpea salad, you charmer you. I whipped this Mediterranean Chickpea Salad up with what I had in my fridge and pantry. I did this when I had no time to cook or wait on the oven for a quick meal. My husband has been eating this non-stop since I made this, deeming it one of his most favourite recipes I’ve ever made. COMPLIMENTS of the highest order, friends. The flavours here are divine when combined, and absolutely addictive. Once the salad has been left to sit for an hour, or even the next day. 6 ingredients, a quick vinaigrette, and that’s it. The best part? It all comes together in just 15 minutes. It’s been a crazy few weeks. So much has been going on, and I’ve been struggling a bit with self-confidence during the process. I think we all do at some point, right? It’s pretty hard to admit, but I was at a point where I began to doubt everything. After a few weeks of endless work, lots of self-doubt and worrying, going to Charleston for the Mediavine conference was actually exactly what I needed. There’s something about blogging conferences. It’s re-energising, re-charging, revitalising. Although it was a work trip, it was great get out of my at home bubble, and to see that everything I was doubting about my abilities were all false. I met some amazing bloggers, learnt so much, and I’ve come back anew to handle all that life has to throw at me. This is relevant, I promise. The week back was hard to transitioning back into, and I have had no time to cook on a regular basis. Greek salads has been my absolute favourite for a while, and I’ve used them in a variety of ways, but never yet with chickpeas. I wanted to make something that would taste delicious, but still also be very filling. This Mediterranean Chickpea Salad fit the bill perfectly. I already had all the ingredients in my fridge and pantry, so I set right to ‘work’, because trust me, this salad was so easy to whip up it’s embarrassing. No work required! 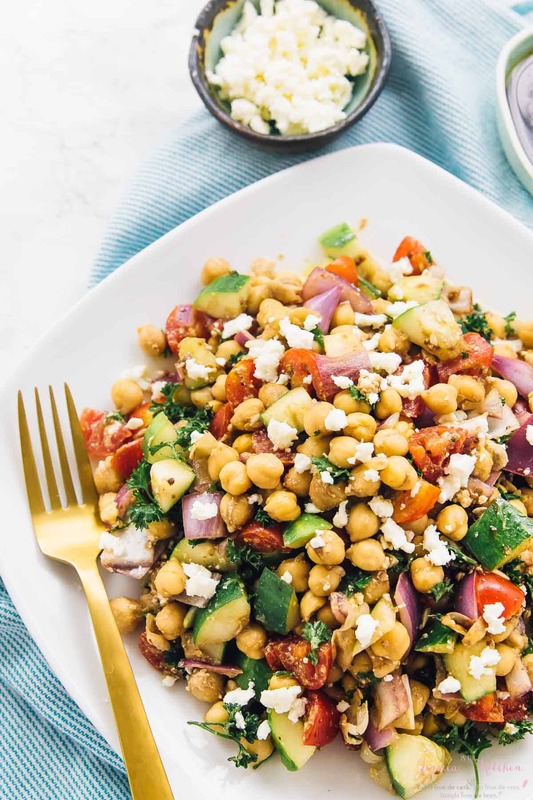 This Mediterranean Chickpea salad was perfect for me transitioning back into the normal work week. It would definitely be great for whenever you are short on time or energy, and for any time at all really. It requires no cooking, you just simply mix ingredients together and it comes together in absolutely no time. That 15 minutes is really just for all the chopping required. 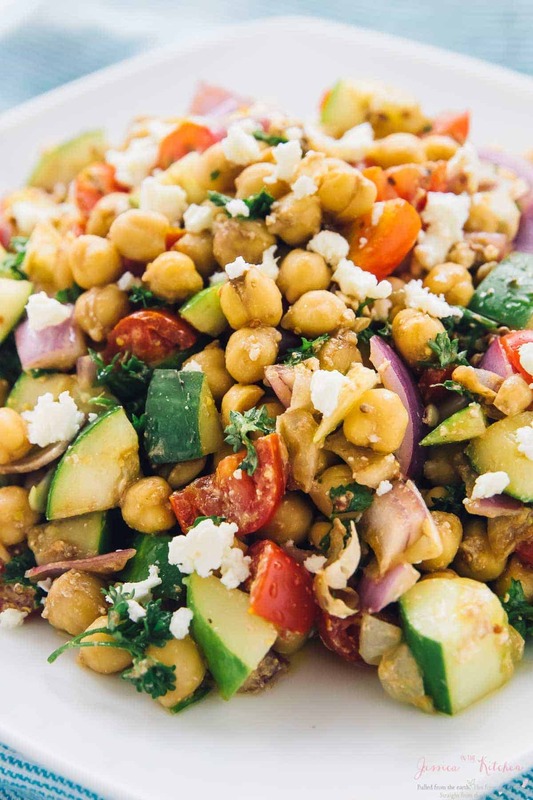 Chickpeas, tomatoes, cucumbers, red onions, feta and parsley are a perfect combo of ingredients. They meld so well together once this light balsamic vinaigrette is poured over it. Better yet, it’s perfect for meal prep and lasts several days in the fridge. We’ve been transforming it too – in burritos for breakfast, and in jars for my husband to take to work. You can add olives, or even use white beans instead of feta, and make it completely yours. I guarantee you’ll enjoy this salad! P.S. while it’s not mandatory, if you let this sit for an hour, the flavours will blow you away. The salad really benefits from the acidity in the vinaigrette pulling out even more brilliant flavours, so it’s definitely worth it! P.S. are you watching our Youtube Channel?! Click below to subscribe and watch our latest video! 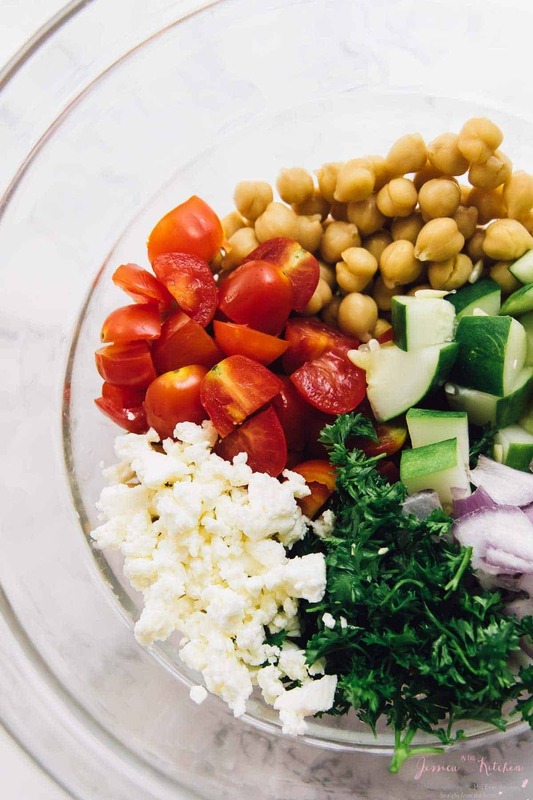 In a large mixing bowl, add the chickpeas, cherry tomatoes, red onions, cucumber cubes, feta cheese and parsley. Pour the vinaigrette over the salad and toss again to combine. 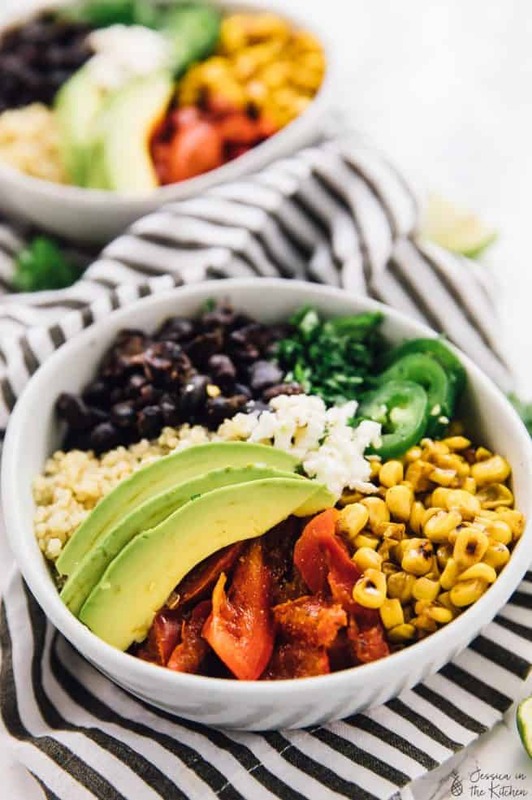 OPTIONAL, but makes a delicious difference: Cover the salad and let sit for 30 minutes to up to an hour so that all the ingredients are completely soaked in and the flavours combined. Serve and enjoy! If you try this 15-Minute Mediterranean Chickpea Salad please let me know in the comment section below, or tag me on instagram with the hashtag #jessicainthekitchen! For more exclusive recipes follow me on Instagram AND on Snapchat: jessinkitchen. 1. This recipe is vegetarian and gluten free. 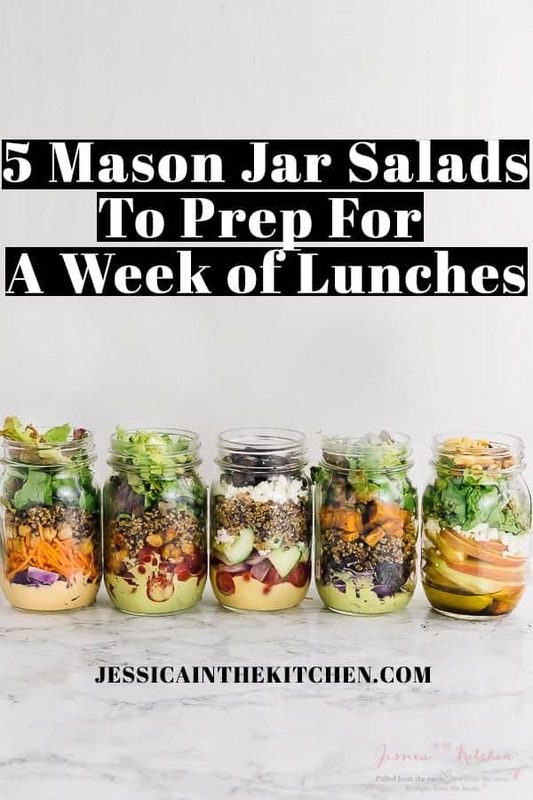 You can prep this salad ahead of time for meal prep for sure, and you can store it in an airtight tupperware container. Swap the feta cheese for tofu feta, white beans or olives. I just made this salad and it was delicious! I definitely will be making this again! Thanks for posting! Chickpea is definitely my favourite legume. This is for sure my go-to salad if I don’t feel like spending too much time in the kitchen. Thanks so much Angie!! Definitely a go-to salad for me! Awwwww. We definitely all go through periods of doubt. I know I do! It was great meeting you at the conference. I am so glad you came! Aw thanks so much Nicole!! I’m SO glad I met you too and so glad I came! It was a life changing experience!! Oh thank you so much for our kind words!! <3 <3 They mean SO much to me!! I do hope you and your family continue to enjoy my recipes!! Thanks for commenting! I just made you this chickpea salad…it is a winner! Hubby loves it as well! Will definitely be making it again. I tried this salad when I was short on time and it was the perfect meal. I had all of the ingredients and it came together so quick. I’m so happy to hear that!! Thanks so much for letting me know and so glad you enjoyed! This is excellent! I put mine in a multi grain pita pocket and ate it like a sandwich! Leftovers will be eaten as a salad! Truly yummy! Oh I’m so happy to hear you enjoyed this!! I love the way you did it in a pita pocket, so smart! Thanks so much for your feedback! I want to let you know how much I love your blog, your pictures and your delicious recipes. You are my #1 go to site when I am looking for new and healthy recipes.Thank you! Aww thanks so very much!! That means so much to me and I’m so happy! You’re so very welcome!! This was delicious! I threw in some sliced kalamata olives and a thinly sliced banana pepper from my garden for a little heat. This is going into the regular rotation! SO happy to hear that!! Thanks much for you feedback!! So delicious! a new favorite! Hi Danielle!! We’re happy that you enjoyed our recipe!!! Thanks for reading! Thank you so much Jeronna! We’re glad you enjoyed! Just made this & it is delicious!!! I was looking for a way to use up all the cucumbers and cherry tomatoes from the garden and this recipe is perfect. Thank you so much for posting it, I will definitely be making it again soon. Hi Mandy, so happy to hear that!! You’re so very welcome and thanks for your feedback! Love love love this salad, thank you for sharing! Loved the 15 min Mediterranean bean salad. I now have made it several times. Thanks for sharing your recipes. Thanks for letting me know Yvonne – so happy to hear! It’s 206 calories per serving, which depends of course on whether you’re using regular feta cheese, vegan feta cheese or olives instead! Thank you! It looks delicious and I plan to give it a try. 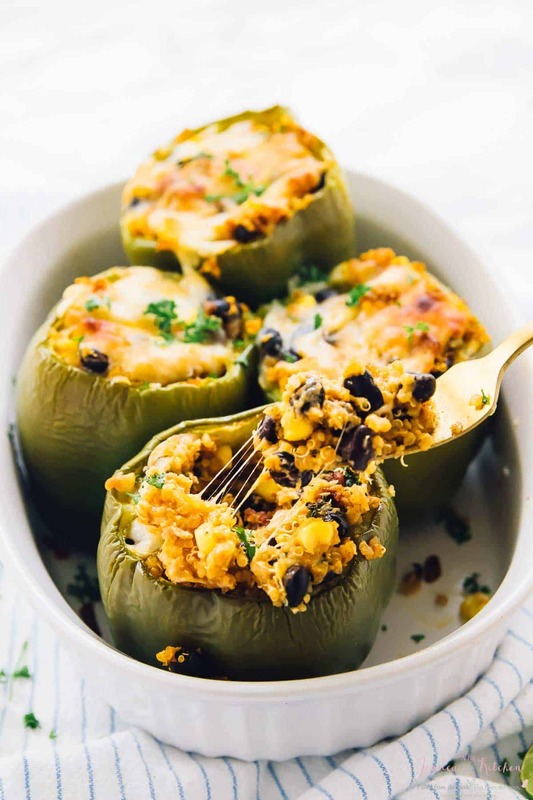 Awesome Andrea we’re so happy that you stumbled upon this recipe! We”re so glad that you and your boyfriendd enjoyed it! Thank you for reading!